Hi Johnny, how are you today? 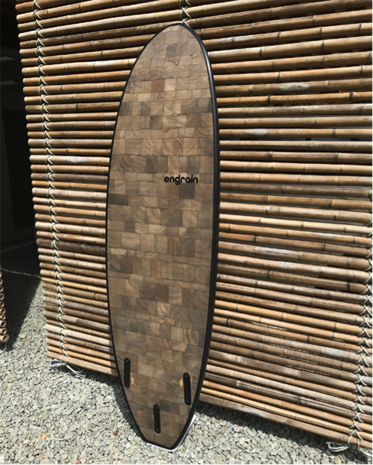 Can you tell me a little bit about Endgrain Surfboards? Hi Taryn, I’m awesome; thank you for asking me to do this interview with you. 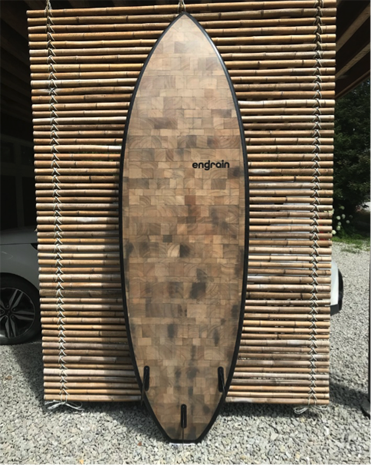 Endgrain is a company focused on designing/building custom hand shaped surfboards, kitesurf boards, wakesurf boards and performance surf paddle boards (under 8’6”). Our process starts with a surfboard CAD program, but from there, I’m all about old school manual plotting and cutting; there’s no CNC machine in my world -haha. I use a template to hand shape EPS foam, then vacuum press 1/4” end grain balsa wood to the entire board with a special layup. This gives the boards incredible strength, ding resistance, along with a nice lively flex. I also custom lathe round leash plug blocks out of hard maple and epoxy glass them into the tail area; it’s just a nice little feature around the leash plug. 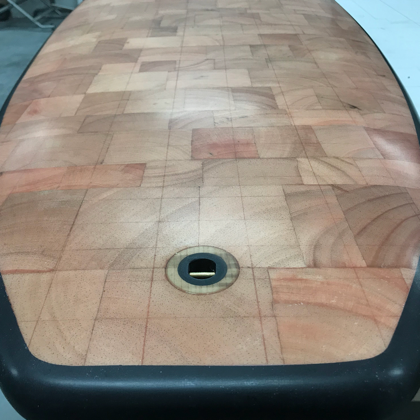 The boards are stained, epoxied and fiberglass cloth wrapped, then topped off with a UV resistant epoxy hot coat and clear lacquer gloss coat. 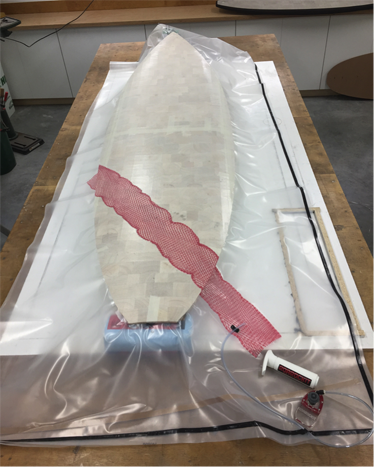 What got you into building surfboards? How long have you been building? Well funny story, quite a few years ago, there was this tiny surf paddleboard that I wanted - a 7’ vanguard style - until I saw the price, $2400US. I thought “that’s nuts”, it’s just a small chunk of foam with epoxy and fiberglass cloth. I thought, I’m going to make one... shouldn’t cost me more than a couple hundred dollars and a few hours of labour. I did some research and hooked up with the awesome shaper Lee Brittain (Rogue Wave). He gave me some tips and let me borrow his fin router and jig. (OMG Lee if you’re reading this, I totally forgot to give it back to you. I still have it; I’ll be in touch). While the first board I shaped turned out not too bad, it cost me about $600 and more than 100 hours in labour. I should have just bought the one for $2400US; it would have been cheaper, but then I was hooked and wanted to learn and shape more. At that point I realized boards cost what they do for a reason; there’s a crazy amount of skill and labour that goes into every custom board made. That first surf paddleboard I made, I made that shape umpteen times over, refining each time; perfecting my skills and fine tuning that shape; testing each one, then building another to see what effect the changes in design had in how the board rides. Then I started building surfboards, and my whole world changed. It took half the time and materials; it was almost easy - haha. 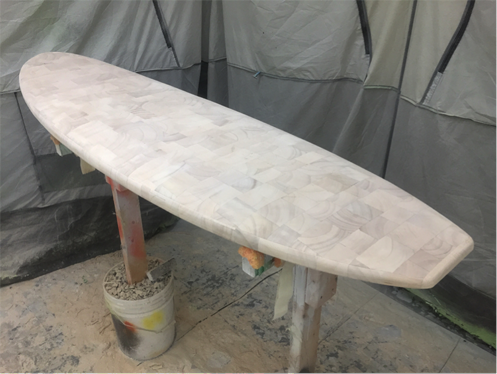 It was fun to come home after a trip and build another surfboard with the changes I wanted; I could really fine tune a board to whatever conditions I wanted. What inspires the design of your surfboards? I’ve spent the past few winters in Ecuador with my wife working on our surfing skills in a town call Ayampe. Hanging out there, I’ve seen quite a few wooden surfboards shaped by both local Ecuadorian shapers and shapers abroad. The beauty and craftsmanship I saw in those wood boards inspired me to learn how to go beyond simply shaping foam and glassing it; I wanted to refine my craftsmanship. I got in touch with a local Ecuadorian shaper and asked him to make me a hollow core balsa blank so I could finish it myself. I still haven’t finished that one, but it inspired me to build and shape my own boards. But I still wasn’t satisfied and wanted to build something different. That’s when I found end grain balsa wood, and the challenge began. I needed to figure out how to work with the stuff, but for the first time, Google couldn’t help me out. There’s nothing on the Internet about how to shape end grain balsa into a surfboard. It’s been almost 6 months of R&D now, and a shed full of demo R&D boards; and I’ve finally figured it out and am very happy with the end product. How long have you been surfing for? Wish I could say I’ve got my 10,000 hours in surfing, but I don’t, I’m a long way from it. I hover in the beginner-intermediate range, but I did grow up as an avid water sports guy, waterskiing, kneeboarding (back in the day it was a cool sport haha), wakeboarding, windsurfing, kitesurfing. I’ve also been snowboarding since its inception, and enjoy mountain biking, but I have to say, surfing is probably one of the hardest sports I’ve ever tried to learn. Even so, I love it; I’m hooked for life. There are so many different variables every time you go out. I’ve learned that the easiest part, so to speak, is getting up and riding the wave, but there’s still so much to learn once you’re up and riding the waves. It’s getting out there, reading the waves, positioning yourself to catch the waves and then popping up to standing which is the hardest part; but I’m loving the challenge. 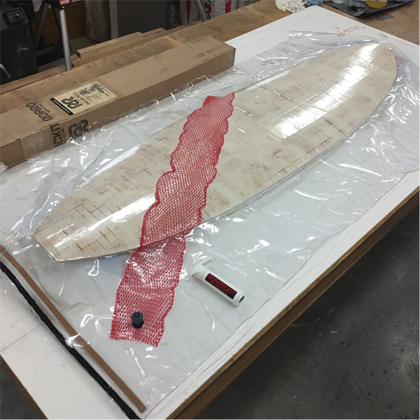 What is it like to start up your own custom surfboard building business? Well, I never really thought of it until you asked the question; now I’m a bit scared - haha... I kind of feel like a minnow with a lot of untamed knowledge swimming in a school of really big fish, hoping I’ll be able to grow without being eaten up. I actually try not to think about it, or even follow what other people/companies are doing. If I do, then I find myself questioning why I’m even doing this; it’s pointless, there are so many board companies out there already. But then I give my head a shake, go back to my shop and see my boards and say “aaaah yes, that’s why”. I’m inspired by the look of the boards being so different. They’re structurally strong, have huge compression strength, will take a beating and last, and they surf really well. There’s a difference riding a wood board compared to a foam board; they’re such a solid lively feel in the water. How do you use Roarockit products in the making of your boards? How did you find out about us? It was a bit of a process before discovering the benefits of Roarockit products. When I first started thinking of how I was going to make my wooden boards, I started by designing on paper. I was going to build the standard way; with wooden ribs first then laying strips of wood on top to create a hollow wood core surfboard, but this involves a lot of work and results in a heavier board. Then I came across a post about building “Bahrman rails” or “rails first”; a technique developed by N. “Huck” Bahrman in which you build the wood rails or the outside 1.5” of the board first. This framework results in a sturdy foundation that will support a variety of methods for filling in the remainder of the board. This method really intrigued me. It was something totally different. Still wanting to use end grain balsa, I realized I would need to make a mold first to pre-shape the wood. I decided to make the Bahrman rails out of carbon fibre then glue the whole thing together, but I needed some sort of vacuum bagging system, and the search began. Not sure if what I wanted to build would even work, and knowing I didn’t want to spend a ton of money on a standard vacuum bagging system, I kept searching and eventually came across this image of a vacuum bag fully engaged molding a skateboard deck without any pumps hooked up to it. That search lead me to Roarockit. I called them up, spoke with Norah and Ted about their products and my project. They guided me to the right products and all the tech help I needed. So I built my very first two wooden surfboards completely hollow with carbon fibre Bahrman rails, capped the top and bottom with shaped end grain balsa. I finished the carbon rails off after with cork, then epoxy glassed the whole thing. It turned out awesome, incredibly strong, light weight, and it sounded like a drum. I learned a lot from those first two boards, and that this technique was way too time consuming and not cost effective at all. My procedure has evolved a lot since then into what my boards are now. I use the Roarockit Thin Air Press Kit three times with each board built. I love it; it’s so simple and easy to use. Other than keeping it clean, which is easy, there is zero maintenance to it. I also use the TUG Luthier Kit when I make my own vacuum bags for boards longer than 6’6”. When will you start to sell your custom surfboards? Hopefully by September of this year I’ll be ready to start selling my boards. I have lots of friends willing to demo my boards and give me honest constructive feedback, which goes straight back into the next board builds. I’ve got one shot to get it right; I don’t want to screw it up by putting out an inferior product. And if it’s not September it’ll be October. If people wanted to find out more about your surfboards. Where can they see your creations and contact you? Thanks again for your time Johnny, any last words for the readers back home? Thank you Taryn. I just want to say wherever you live, there’s a local shaper somewhere close by; their boards are worth every penny and probably more. There’s a lot of skill and craftsmanship that packs into every countless hour that goes into your board. It’s a labour of love, not a get rich quick scheme. Support your local shaper.